I was looking on Pinterest for a non-candy alternative for Valentine’s Day this year. 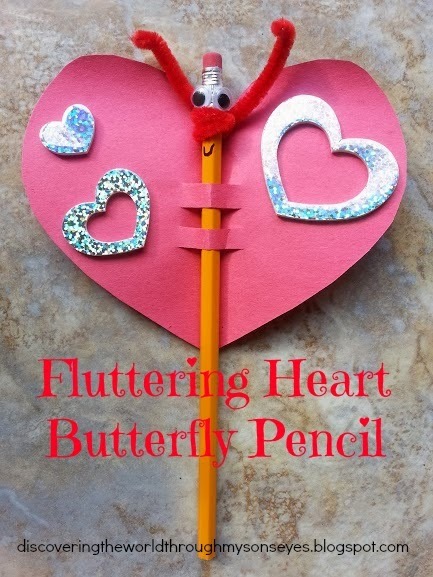 I came across this cute Valentine’s Day straw topper, and it inspired me to make these cute Valentine’s Day Fluttering Butterfly Pencils. This was a pretty simple craft that even my little man could help with! All you need is pencils, red construction paper, chenille stems, glue stick, and stickers of any variety. I cut the hearts, and made four slits right in the middle. Little one helped by decorating the hearts with stickers, and/or markers. I placed the pencil in middle of the heart, and wrapped the chenille stems to make the butterfly antennas. Little one helped by gluing the googly eyes, and I used permanent marker to make the smile. To secure the pencil I placed tape in the back, and a label that I printed with this message: “Happy Valentine’s Days from your friend” with my son’s name. Will your children be gifting candies at school or with his friends? Or will you be making something with the kiddos? Please do share, like, pin or comment. This is too cute! I had your post up earlier today but didn't have time to comment and Kooks walked by and said "we have to make that now!" I'm pinning it now and I think we will be making some very soon. Oh, these are so cute!! Thank you for sharing at Sharing Saturday!